Tuesday, April 9, is the Primary Election for several local government entities. Click HERE to see / get the Official Sample Ballot. 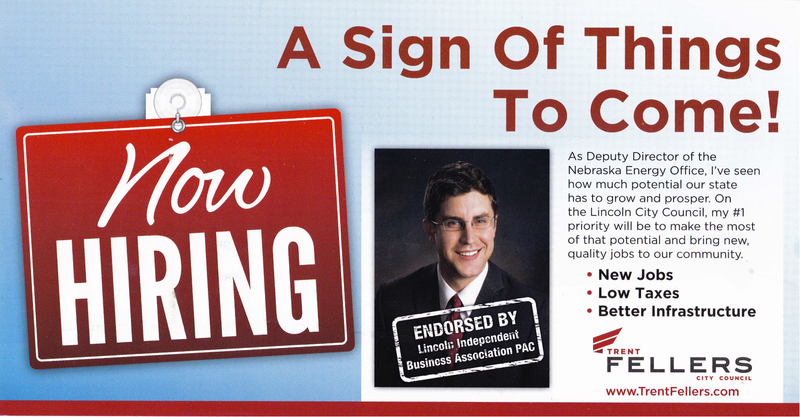 To read the article we published about candidate Roy Christensen, click HERE. If you’re looking for a similar article about Mark Whitehead, we will be publishing one not long after this, but without the Q & A (unless he gets a hold of us). In preparing to vote in Tuesday’s election, we found basic background information about each candidate from a variety of sources, which includes the candidates’ campaign websites, their mailers, and from news stories. We found that several important issues had not been covered in any of those sources and decided to make efforts to contact each of the three. 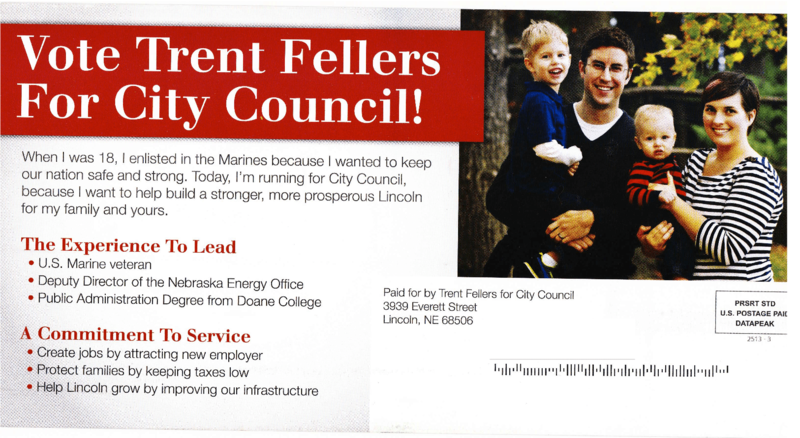 See the embedded images (bottom of the article), which are two mailers sent out by Mr. Fellers’ campaign. To see a mailer sent out by the Lancaster County GOP, which features all three Republican candidates, see the article about Roy Christensen, here. 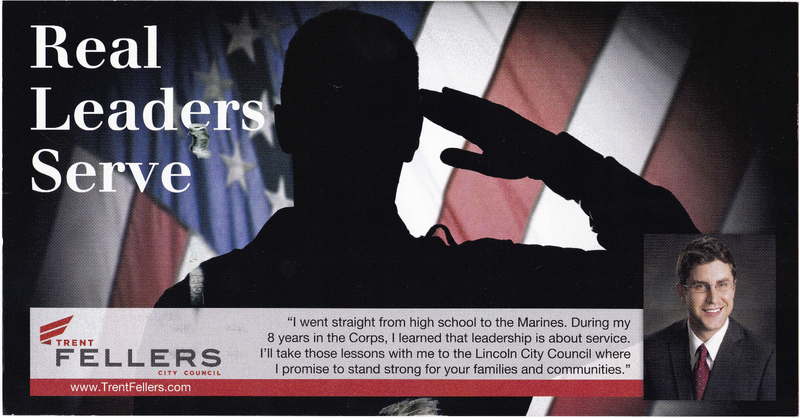 Mr. Fellers was Campaign Manager for Jon Bruning for Senate, Inc. TAXATION POLICY: What are the candidate’s plans, in more detail, for handling budgetary issues, if they have pledged that they will not raise taxes? 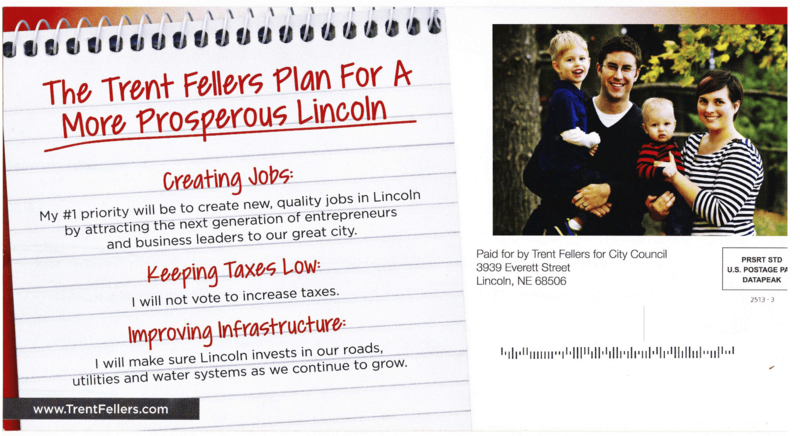 Rationale behind the question: Two of the three candidates (Trent Fellers, Mark Whitehead) have campaign literature which features the direct statement, “I will not vote to increase taxes”. Roy Christensen’s campaign material featured the statement, “We need to hold the line on taxes”. Is such a blanket statement a good idea? Let’s just say, we’re skeptical on the subject. Mr. Fellers believes that taxes do not need to be increased, because City spending can be refocused. Like fellow candidate, Roy Christensen, Mr. Fellers cited the City’s Wheel Tax and the allocation of those funds as an example of how spending should be changed. Wheel taxes were originally intended only for the maintenance of streets and roads, but an example of funding not appropriately allocated is the move of the Wheel Tax funds into the City’s General Fund and the use of those dollars to build new streets around the new Arena. Would large cuts be needed to fill gaps in funding if such re-allocation of dollars were to occur? Mr. Fellers doesn’t believe large cuts would be needed. It’s more a matter of streamlining and finding efficiencies. Also like fellow candidate Christensen, Mr. Fellers cited potential consolidation of City of Lincoln and Lancaster County government functions, noting that there are two police forces, for example. Does Mr. Fellers envision a total consolidation of City of Lincoln and Lancaster County? Current state statutes would prohibit total merger. “FAIRNESS ORDINANCE” REFERENDUM PETITION: Leaving aside any potential position on the issue itself, does the candidate believe the City Council has handled the referendum issue properly? IN OTHER WORDS: Are the City Council’s actions (or lack thereof) currently violating the law? Rationale behind the question: The referendum petition drive, which garnered many multiples of the number required, had two legal effects: 1) the ordinance voted on by the City Council could not go into effect and 2) the City of Lincoln is required to put the ordinance in front of Lincoln voters. Nearly a year later, no vote has been conducted. Mr. Fellers believes the City Council has not handled the issue correctly and that the law is currently being violated. What would you do about this issue, if elected? Move to convene a vote at the next available election. The City can’t afford to convene a special election for this purpose. Note: The next available election would be in May, 2014. Are “CLEANER, GREENER LINCOLN” and associated “SUSTAINABILITY” efforts / policies a good idea, especially at this time based on economic conditions, and should the City continue such policies? Rationale behind the question: We will cite previous articles and our Sustainable Development page as the basis for raising this issue. Please see the footnote for a list of links. Note that Mr. Fellers is currently the Deputy Director at the Nebraska Department of Energy. City policies like “Cleaner, Greener Lincoln”, etc., make no market sense, and that’s the problem. The ideas that such programs advance don’t work and have no practical application. At the Department of Energy, it’s all about measuring efficiency. For instance, it makes sense to encourage people to install more energy efficient furnaces, because they do reduce their energy use and save money. Current City policy impacting the building codes aren’t practical either – the cost of doing business is made more expensive and most of the ideas have little practical application. Regarding LES, it’s true that there is going to have to be some demand-side management as demand continues to grow. If there isn’t some sensible management, the resources won’t be available to meet demand. It’s obvious that the best way to meet those demands through the use of coal, which is cheap, and it is burning cleaner now than it ever has. It makes no sense to push LES towards the use of renewables; the current renewables are not practical. The only potential viable alternative to coal is natural gas, but it’s likely in the future. Considering his current position at the Department of Energy and comments about LES, a question was posed about recent moves by LES to employ the use of Smart Meters as a demand-side management measure. Mr. Fellers has heard of, but is not well informed about Smart Meters, but said he would look into the issue.